← No Butts – There’s a drought on! Spanish Bluebell Invasion Hits Home. Well, the weather has been fantastic for the garden, and I’ve been out there trying to tame ten years or more of neglect. I had looked forward to the bulbs that are prolific in one large, overgrown bed, thinking I had bluebells I could move down into the hedgerow. But it turns out they are Spanish bluebells. Gorgeous, but dangerous for native English bluebells and very invasive. They are bigger, stronger and out-compete our native species. Not only that, but they cross-pollinate the English type to produce hybrids. This would eventually mean the demise of our own native, charming English bluebells. Not something I like to contemplate. 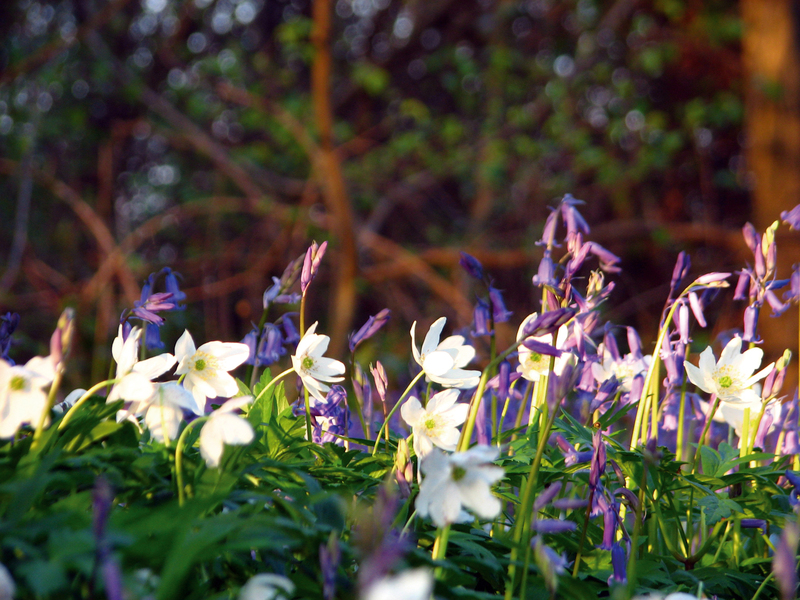 Here’s a photo of our English bluebells growing with anemones. Charming! If you want to see them closer, just click on the photo. So the huge job of removing them has begun. They throw out underground runners, seed and tiny bulblets, so it’s going to be several years before they are completely eradicated, even with a little help from glyphosphate. If you have bluebells in your garden, then it’s worth checking yours are native, too. English ones have flowers down only one side of the stem, causing them to arch beautifully as they open. Spanish ones have flowers all around the stem and stand upright. The leaves are much broader than English bluebells, too. English are only about 1cm wide and the Spanish much more (mine measure 2cm on the larger plants). If you want to find out more about the problems associated with Spanish Bluebells there’s a BBC video here. For clearly explained and illustrated differences between the two species, have a look at this site. This entry was posted in ecology, lifestyle and tagged ecology, environment, garden, gardening, growing, home, lifestyle, photograph. Bookmark the permalink. Would you like to join my journey by email?